On Tuesday, Apr. 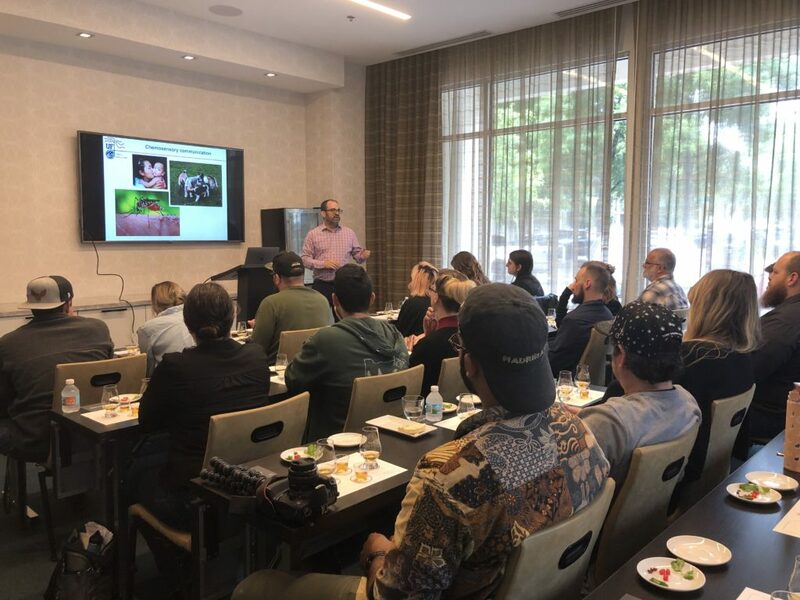 2, UFCST Director, Dr. Steven Munger, met with over 30 mixologists from Gainesville and Jacksonville, Florida to talk about smell, taste and flavor. Sponsored by Glenfiddich and the AC Hotel in downtown Gainesville, the educational session focused on how we smell and taste, how those sensations are combined in the brain to create the perception of flavor and how smell and taste disorders impact a person’s health and quality of life (including the flavor of food and drink). Dr. Munger also issued a challenge to the bartenders: can you create a cocktail that uses this flavor knowledge to appeal to someone who has a smell or taste impairment? To say that they were excited about this challenge is an understatement, and ideas were flying about the room. They are going to put their creativity to the test, too. Bartenders can submit an entry to be judged by a local panel of experts. The top four candidates will then present their cocktails (and a non-alcoholic “mocktail” version) at the May 17 social that kicks of off SmellTaste2019. The winner will be decided by the votes of SmellTaste2019 attendees. Thanks to Glenfiddich and the AC Hotel for helping to make this happen. Whether it is engaging the other senses to enhance the enjoyment of food or drink, providing mutual support or advocating for more research and better health care surrounding chemosensory disorders, SmellTaste2019 is about exploring ways to improve the quality of life for people who have a smell or taste impairment. We hope you can join and be part of the experience, co-organized by the UF Center for Smell and Taste and by Fifth Sense.